If you are familiar with the Japanese manga Beelzebub, you probably know that delinquent Tatsumi Oga cannot be separated from Baby Beel by several meters. Doing so results in instant death. This image, which is making the rounds on Japanese websites and bulletin boards, shows Oga and Baby Beel. It looks like it's from the cover of the comic book Weekly Shonen Jump; however, I'm not 100 percent sure. 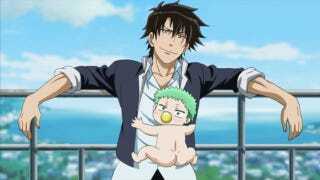 What I am sure about is if you put your finger over Baby Beel's head, you give Oga a baby dingaling.